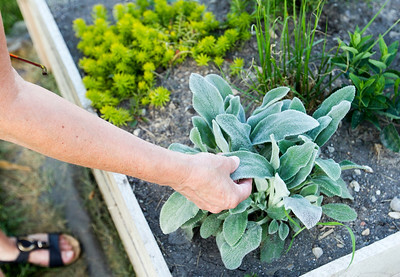 Sarah Nader - snader@shawmedia.com Diane Dugovic of Algonquin touches a lambs ear plant at the teaching garden at the Algonquin Public Library Monday, June 20, 2016. The garden consists of four different sections, cutting, sensory, organic vegetable and the STEM Education garden. Children and volunteers helped plant the garden and take care of it. 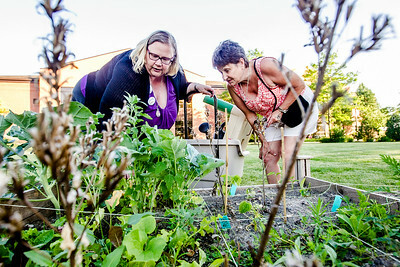 Sarah Nader - snader@shawmedia.com Youth service librarian Alexa Newman (left) and Diane Dugovic of Algonquin check out the teaching garden at the Algonquin Public Library Monday, June 20, 2016. The garden consists of four different sections, cutting, sensory, organic vegetable and the STEM Education garden. Children and volunteers helped plant the garden and take care of it.